Our nursery has 20 acres of above ground trees. We specialize in high quality evergreen trees including Blue, White, Norway and Serbian Spruce. 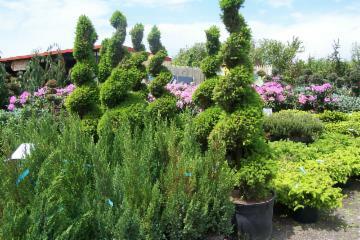 We also have a large inventory of White Pine, Hemlock, & Concolor Fir, Green Giant, Nigra, and Emerald Green Arbovitae. There is also a selection of shade, flowering ,Fruit and ornamental trees, including many grown on our own farm on over 40 Acres !! Popular shade trees include Green Leaf Maples, Oaks, Willow Birch, Ash, SweetGum, Hawthorne, Sycamore, Crimson King Red Maples, Lindens, Locust and more. Flowering trees include a variety of Dogwood, Weeping Cherry, Upright Cherries, Crabapple, Purple Leaf Plum, Flowering Pear and many unusual trees including Golden Chain, Rose of Sharon, Hydrangea and much more. 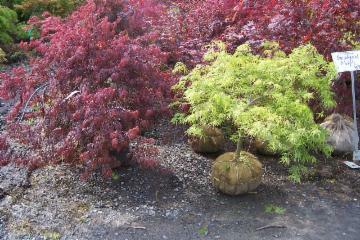 Ornamental trees and shrubs include Japanese Red Laceleaf Maples, Japanese Red Maple Uprights, Alaska and Blue Atlas Cedars, Pom Poms, Spirals, Vanderwolf Pine, Globe Blue Spruce, Fat Albert Blue Spruce, Vanderwolf Pine, Japanese Umbrrella Pine, Moonglow and Wichita Blue Junipers and more.